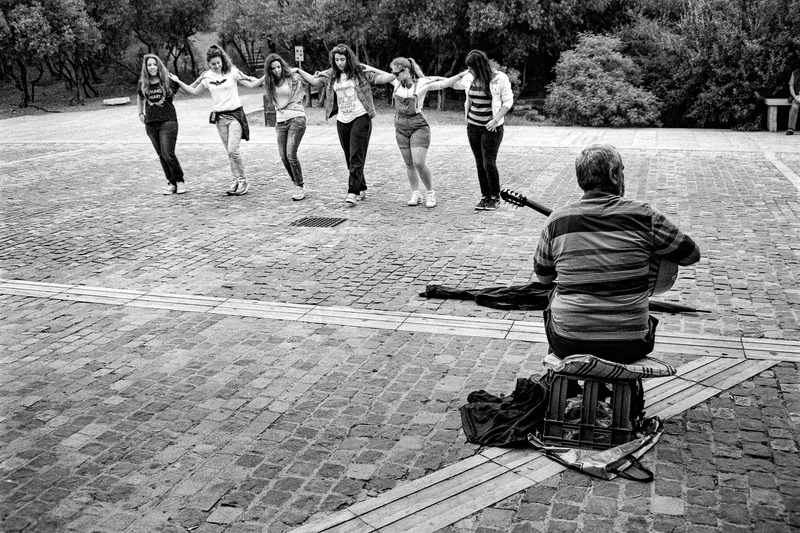 A company of women are staging an impromptu street dance to the tune of a street musician playing bouzouki, at the Dionysus Aeropagite walkway, below the Acropolis in Athens. This photo is an example of being in the right place, at the right time. For me it was a usual walk in the area, as the lack of cars means a relatively quite walk but the central location of the walkway and the different types of people it attracts, offers many chances for street photography practice. There are many street musicians there, single players to complete bands, playing traditional Greek music, contemporary Greek music, Classical, Rock, Latin and everything else one can imagine. What is common in all cases though is the minimal interaction with the people passing by, with the most common being just the handing of money to the artists and sometimes people deciding to take a break near a musician that plays the kind of music they like. This impromptu street dance is something I saw for the first time there; I became aware of it as I was walking towards the spot and I was hoping I was going to be on time and not lose the chance to make the photo. I decided to move behind the musician, as the subject were girls dancing, but I made the shot focusing on him, because I don’t like the front-most element in a frame to be out of focus (the depth of field created by the aperture, would make the girls be in focus as well). I made two pretty similar shots and as I was confident that everything would turn out OK, I continued on my walk. Pingback: WPC: Dance (Fly) | What's (in) the picture?